Do the poor deserve our junk? Sick of consumerism? You might just be a minimalist! Do flat surfaces in your home just seem to attract every single piece of junk that is lying around? If you’re anything like me, flat surfaces have been an ongoing problem that can be hard to resolve – unless you have the tools and knowhow to stop them becoming serious clutter-collectors. 1. If it isn’t a “display item”, don’t display it! 2. No more than three items on any flat surface. 3. Wipe down working surfaces at least twice a week. I’ll be honest – these rules require discipline, and it takes time to learn to have discipline. But they’re great rules to have in your pocket, and they will keep flat surfaces clear if you begin to practice them throughout your home. I talk about the 3 simple rules in a bit more detail below. In short, nobody wants you to display your clutter, your child’s dirty underwear or your unpaid gas bills! Flat surfaces are for displaying items of value or purpose. They’re also for occasional use – for items we’re currently using then we put away again afterwards. An example might be a television remote – we use it, rest it on a coffee table while we’re watching TV at night, then put it away safely in a drawer in when we’re done with watching. In wet areas such as the kitchen, flat surfaces are for working and preparing food. Not for keeping knick-knacks and junk mail. In the bathroom, flat surfaces are for personal grooming. Once we’re done using the flat surface to put our grooming tools on, the items are stored away again. Exceptions are a bar of soap, and maybe a glass containing toothbrushes and paste. Individual personal items should be stored out of sight and away, or a family bathroom can get cluttered really quickly! If your flat surfaces are covered in stuff that isn’t “display” items or of current actual use, bag the items in a plastic bag, then sort through them. Discard anything you don’t use and find appropriate places for items of value and purpose. 2. No more than 3 items on any flat surface. This is what I call my “Enid Blyton” rule, and it’s a good one 😉 In Blyton’s “The Naughtiest Girl in the School”, the protagonist learns that each child may have three items on her nightstand. Three items should be enough for anyone on any flat surface. Having a set number of items for flat surfaces makes them easy to dust and keep clean, because you don’t have to move a host of items to wipe the surface down. It’s also safer in earthquakes or fires. Some people choose to rotate their items, and others keep their items the same year after year. But the 3 item rule will help keep your flat surfaces clear. Wiping down working surfaces helps keep things tidy. As you wipe, put away anything that shouldn’t be out on display, and bin anything that is post date. I’ve a habit of leaving cleaning products out after I’ve done with them, so wiping reminds me to put everything away. For kitchens sponges and plugs, I keep a plastic container under the sink. I wring out anything that is wet, and store it out of sight. Because we have a dishwasher, there is no need to keep our plug and dishwashing liquid on the sink the whole time. Items I keep on the kitchen bench all the time include: handwashing soap and the kettle. Sometimes the loaf of bread that is currently being eaten, as we go through a LOT of bread! Why these rules? Why bother? I like living in a relaxed, peaceful haven of a home. I don’t feel like I can ever truly relax when I’m looking around at piles of junk, washing to be sorted and put away, or clutter on flat surfaces. Living in an uncluttered home is healthier, especially for people with allergies and disabilities. Clutter-free homes are easier to keep clean, and have lower levels of dust and dirt. It’s well-known that people who live in clutter-free homes are also relaxed and less stressed. Then there’s the issue of health and safety. People have been trapped in homes and died in fires and earthquakes because their homes were too cluttered, especially in hallways and corridors. If nothing else, keep these narrow spaces absolutely clear. Then there’s the cleaning. Anyone who is the principal cleaner in their home (*waves*) probably feels like they do enough of that already! Reducing the clutter makes cleaning easier and less time-consuming. My house is far too cluttered. I will get better – better habits needed! I think it’s a work in progress. There are a very few people in the world who are naturally tidy and the rest of us have to work to develop tidy habits! Some of us (like me) have hard to work real hard! But being tidy is a matter of having the right tools and just practising them over and over again, until they become habits to us. I guess in the past it was easier to be tidy because people had less stuff, whereas now you need to be creative about storage…. I think you’re right. In the past, people had much, MUCH less stuff and smaller homes to put everything in. We were nowhere near as consumerist – everything went nutso in the 1980s and even crazier since then! (I blame the advent of easy credit!). At first, when I found I could never keep our home tidy, I thought that storage “solutions” were the answer to everything. But they never worked – all they did was re-arrange my junk. The only answer I’ve found that actually works is owning much, much less – and being diligent about allowing stuff into my life. One of the good things about my ex-husband was that he was naturally tidy! I’ve managed to get my parents to stop bringing stuff every time they visit but now I’ve discovered Freegle (a way of exchanging unwanted stuff), I have filled my house up with goodness knows what ‘just in case’. Of course, easy credit will no doubt have fueled the general rise in consumption as well as the low prices relative to income. But that doesn’t help me in my home – yikes 😉. It takes time. Be gentle with yourself. With me, I expected too much from myself and backslid at first. Just start with decluttering obvious stuff that you really don’t like or need, and go from there. As far as free stuff, get rid of Freegle! Instead, donate your stuff to a charity you care about. I donate to the local Hospice shop, and figure that one day I (or someone I love) may need them so I’m giving now, while I can. The other thing that might help is leaving credit cards at home and only bringing cash – cash makes everything more real somehow – or it does for me! Yes, I agree about the cash. Helps with money management as well as keeping the clutter down. Freegle vs charity shops: when I go to a shop I like to buy something to support the cause. Also, in principle I support the ideas put forward in http://www.moneylessmanifesto.org/, which means exchanging fits in with my belief system. Thirdly, Freegle is brilliant for getting rid of stuff that might not be suitable for a charity shop (eg the partially broken frame from my plastic greenhouse – someone wanted it for shelving in his shed; and I got an old Christmas tree, which is very useful for my garden). I love this 3 item to a surface rule. Even if they are large items like the bowls of fruit on the counter, I can still think to myself: Move one, two, three. Wipe. Move back one, two three. Done! That methodical efficiency of one, two, three done. Makes it thoughtless and easy to clean the whole house. Kitchen counters, dressers, fireplace mantle, bathroom sink, everywhere it’s as simple as one, two, three; wipe, done. Also it really requires us to consider our highest priorities. For instance the bathroom sink must have the soap by the sink – so then we have to consider our next two highest priorities. It also allows me to have a couple pretty things on display that ‘spark joy’ but it doesn’t get out of hand. This is a fantastic, limitation and control for me.Thank you! Question? 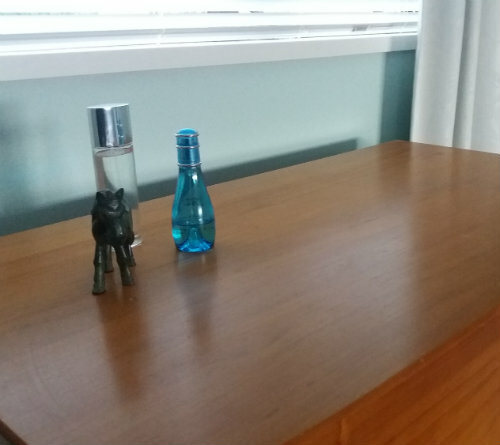 I love having clean clutter free surfaces, but the one thing I don’t know where to put is the kids water bottles and my husband protein shake blender bottle, as they use these items throughout the day and leave them in a corner of the counter…. it drives me crazy, but I cant put them in the cupboard as they aren’t clean and being used every hour of the day… I hate having them sit on my counter top… any suggestions?